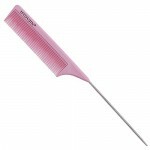 As a daily-use hair comb, it can promote blood circulation and clear and activate the channels and collaterals. It is an ideal way to protect your hair. The highest quality bristels are to smooth and straighten even thick hair while rounded tips massage the scalp. No matter massage head before sleep or model for curly hair and straight hair, it is a good helper. Color: Black. Material: Plastic&Rubber Vanish. Smooth Ball-tipped Bristles in an Anti-static, Soft cushion & Natural rubber pad. Ultra-light and perfectly shaped paddle brushes. Beautiful and Convenient. Gentle on your scalp. Healthy for improving your hair quality. As daily-use hair brushes, it is an ideal way to protect your hair & massage your head. Healthy for improving your hair quality. They are really good helpers!